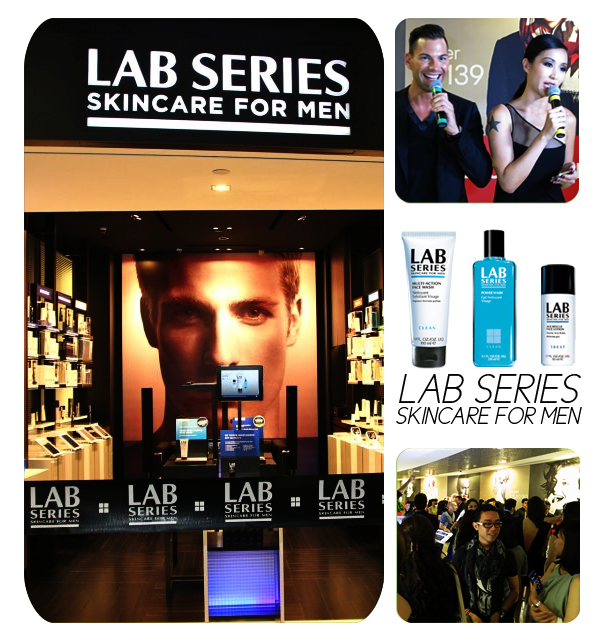 September 27th, 2012 is a day that all men on our little sunny island will remember because *pauses for effect* it marked the grand opening of Lab Series's first ever flagship store! Okay, maybe not so dramatic. But it is certainly something that the the men can cheer about (They probably did so in their heads. You know, to keep up with their macho image. Heh.)! 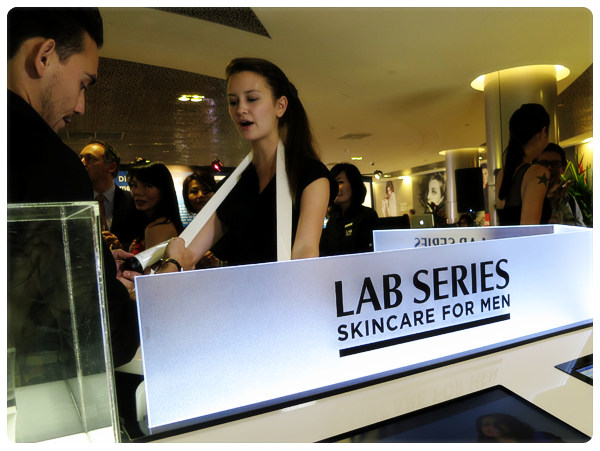 Lab Series, THE authority in men's skincare, announced the opening of the flagship store at ION Orchard, Singapore. 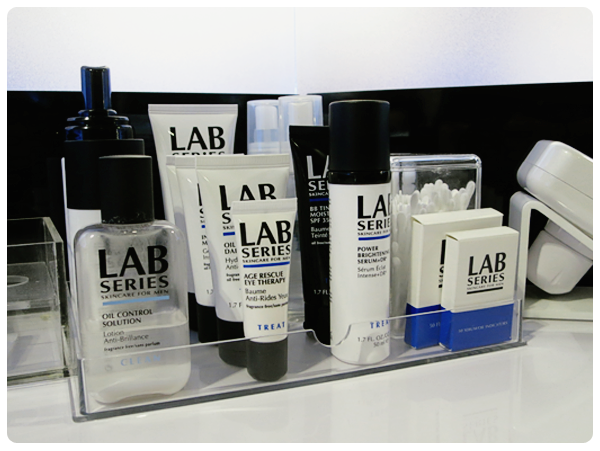 Lab Series isn't just another skincare brand, nuh uh. It represents what every modern man seeks for; technology, innovation and high performance in every facet of his life. This new men-only store offers our men 'offers the expert formulas and proven results to address all men's skincare needs, with the added convenience and comfort of customized services and clear navigation for self-service shopping'. Skincare Simplified: A simple, easy-to-use skincare system that delivers amazing results as quickly as 1, 2, 3. The Shine Eraser: Experience brighter, clearer skin with less shine. The Ultimate Hydration: Achieve healthy and hydrated skin with 3 products. The Spot Eraser: See brighter, smoother, more even-toned skin in 3 simple steps. The Age-Aging Solution: Defy the aging process with a 3-step system for younger-looking ski. The Premium Anti-Aging Solution: An anti-aging system that prevents and repairs the visible signs of aging. Look younger-longer. The Quick Fix: Learn how to look your best in-an-instant. The Energizer: A wake-up call for your skin. The Daily Protection: Daily skincare to keep your skin looking great. 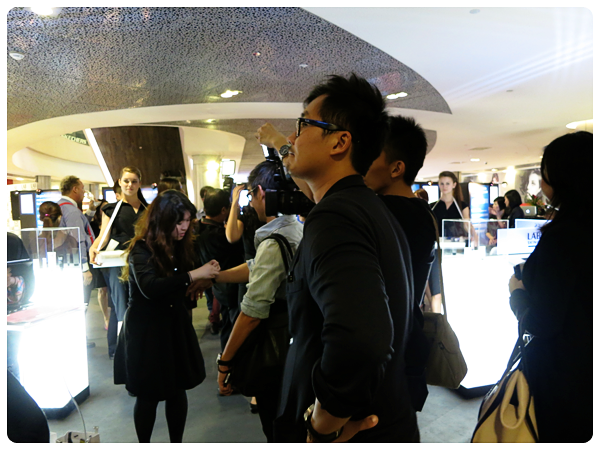 The store also comes equipped with iPads that have Lab Series's Express Skincare Navigation app installed. 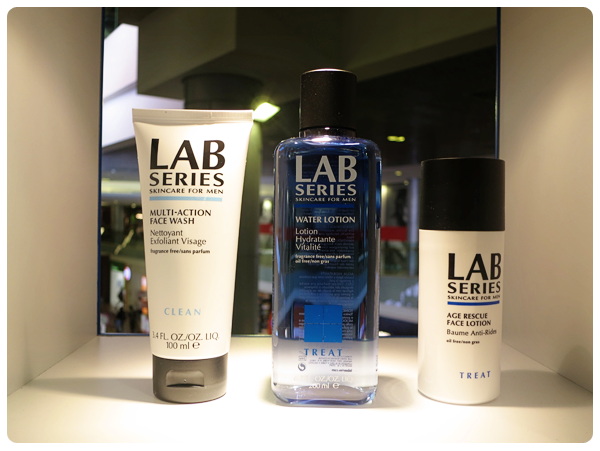 Men can use them to 'find the right Lab Series products to fit seamlessly into their active lifestyle'. Here's my date for the night (And for the rest of my life too. :D), M! 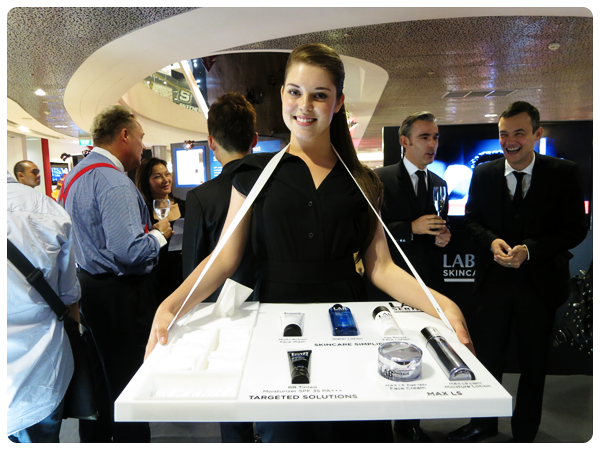 There were gorgeous Lab Series models going around with trays of Lab Series goodies which I eagerly swatched. And made M swatch too! It's a training that all beauty bloggers' boyfriends have to go through. Heh. One of the goodies which I (Yes, me!) 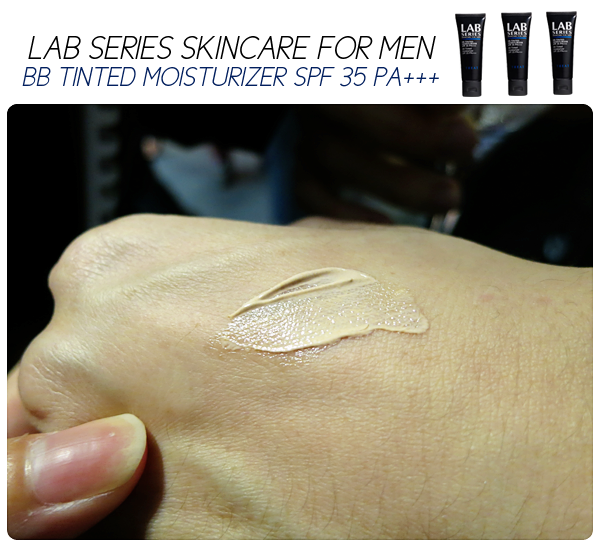 was extremely interested in was the BB Tinted Moisturizer SPF 35 PA+++! Yes, siree! A B.B cream for men! Here, in Singapore! The first, ever! And gawd. Lightweight, dewy (Think: Korean ladies' glow.) and with promises of pore reduction, anti-wrinkle, shine control, firming/ toning, redness reduction, barrier repair... Ladies, you need to try this!!! It feels really good on the skin (Coverage is pretty light though...)! And oh yes! 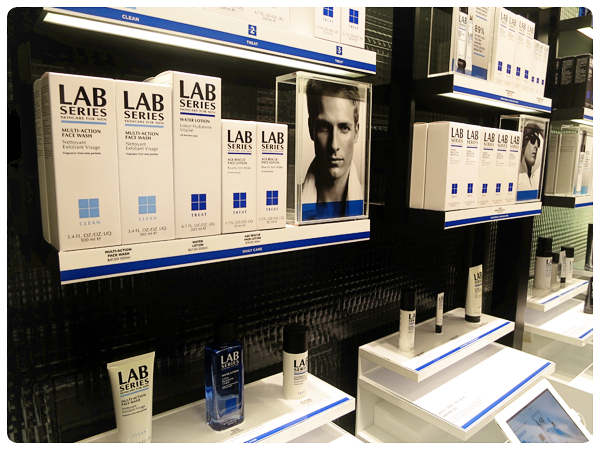 The Lab Series store is made up of 4 colour-coded categories; Clean, Shave, Treat and Body. This way, men can just go into the store, get what they need quickly and be out, pronto (Guys, shopping's really fun!!! Really!)! 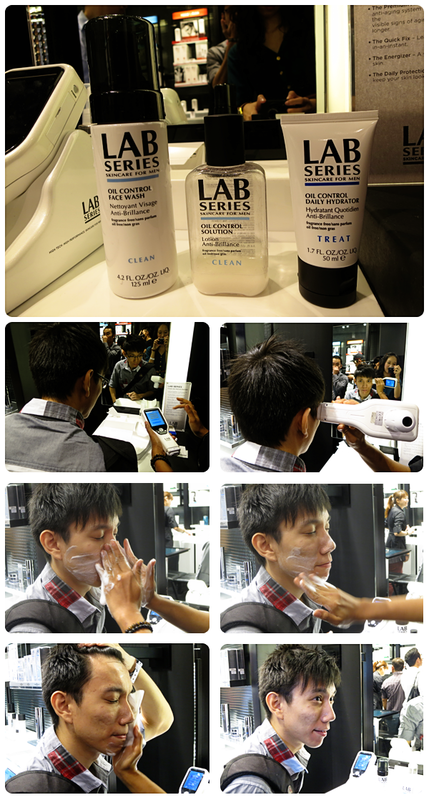 Here's M trying out The Shine Eraser, one of the aforementioned Lab Series Instant Skin Refresh Series. M's skin is of the combination-dry type. His T-zone is really oily but the skin around his mouth is dry like the Sahara desert (He sleeps at like... 3am in the morning. And wakes up at 2pm in the afternoon. I do nag at him about it but nope, he won't change his bad habit. Even in the name of love. Sighhh.). 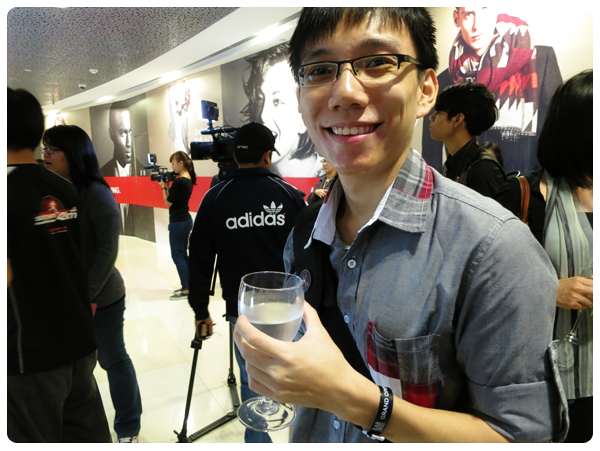 After the session, he turned to me with sparkling eyes and told me it was really refreshing (He was like literally "WOW!!!)! And hinted very obviously that life would be perfect if someone could help him apply his skincare products every night. And I was like "Yeah... That would be really great. I'd like that. THANKS!". Haha. It is really... Hmmm, heart-warming? Haha. I don't know but I always get a nice fuzzy feeling when a new brand lands in Singapore. Like yay! New additions to the family! Haha. Yes, I know. True blue beauty junkie. Anyway, it is really heart-warming that Lab Series arrived on our shore and set home, especially when it is a skincare brand meant exclusively for the men. 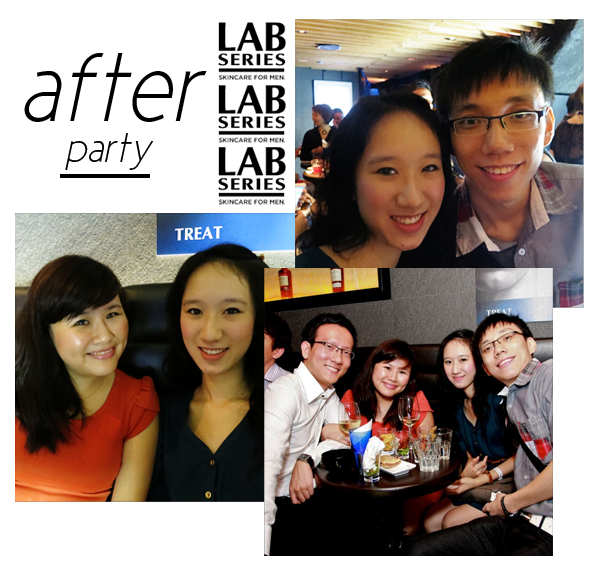 some photos from Lab Series Facebook page here.